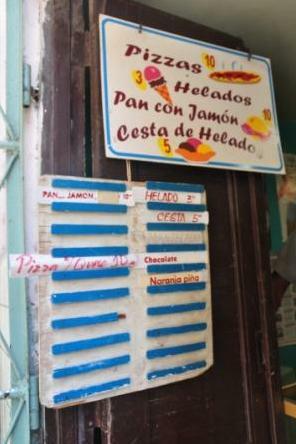 Havana street eats include peanuts, pizza and batidos, a cold tropical fruit drink whipped up in a blender, for less than a quarter. They are sold by street vendors and women standing in windows on the streets. When eating street food you take the risk of contracting an intestinal bug so you might want to steer clear of anything made with ice or water. This woman is selling coquito acaramelado —sweet coconut surrounded by hardened caramel that she makes in her home each night. You will find every kind of pork sandwich, alongside the popular pizza made with tomato sauce, onions and cheese. 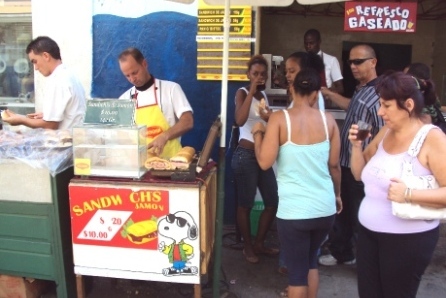 There are fritters made from dough, plantains or taro, and for a quick snack try a paper cup filled with chicharrones (pork crackling). If you hear the call Mani! Mani! you will see someone holding a dozen white cones, inside which are tasty fresh-roasted peanuts. The mani sellers stroll every street and precinct of the city. If you see a line of people snaking into the street, all quaffing a drink, check to see if there is a sign proclaiming Guarapo. This is fresh-pressed sugarcane and, if you peek behind the shop, you will see the enormous sticks of cane going through an ancient pressing machine. Taste it to see how deliciously different it is from our processed sugar products. 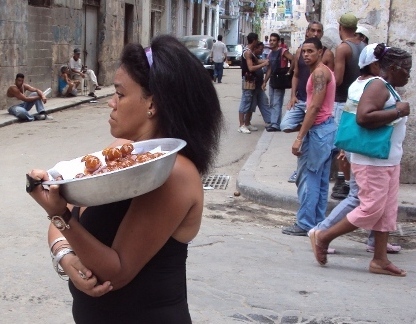 Other Cuban towns specialize in local snacks made by women out of Cuban sugar and tropical fruits. 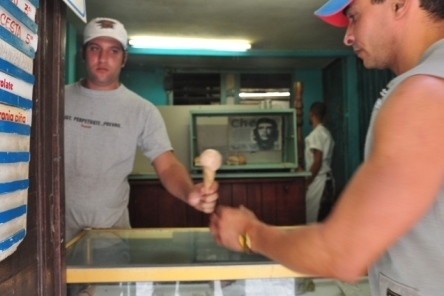 At some markets outside Havana, for 20 cents you can buy a one kilogram slab of crystallized sugar. It is called raspadura and is similar to maple sugar. An unforgettable sugar rush.